A twist on classic challah for Rosh Hashanah or if you just want to impress your friends with what amounts to a very fluffy apple cake, this honey and apple challah is really good with a big cup of hot tea or coffee on a cold day. The honey gives it a nice sweetness without being overwhelming. 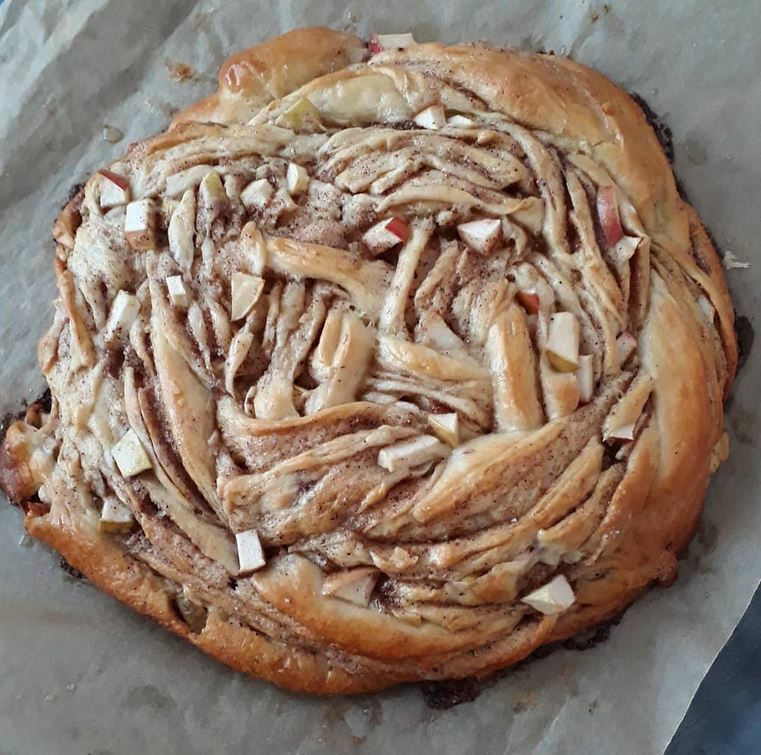 I only used a single apple but I kind of wanted more apples in it, I might try using apple butter instead of regular butter for extra apple goodness next time. Activate the yeast by putting it in the lukewarm water with a pinch of sugar and let sit for a few minutes. Mix the 4 cups of the flour, sugar, and salt in the bowl of a standing mixer (or a very large bowl if you're mixing by hand). To the dry mixture add eggs, yolk, yeast, and melted butter and then mix to form a shaggy dough. With a dough hook attachment, knead the dough on low speed for 6-8 minutes. (Or on a floured surface knead by hand for about 10 minutes.) You can add up to 1/2 cup flour to create the consistency you like. The dough has finished kneading when it is soft, smooth, and holds a ball-shape and let the dough rise in an oiled bowls until doubled, about 1-2 hours. Mix the butter with the sugar, lemon, cinnamon, ginger and nutmeg until it forms of creamy paste. Divide dough in half and roll each half into equal size rectangles, then spread half of the butter filling on each rectangle and dot with apple cubes on the butter mixture. Roll each of the rectangles up into long logs and cut each of them in half, lengthwise. Place the, now, 4 strands of dough cut side up in a hashtag and weave into a round challah. Place dough onto parchment and cover with a dish towel to rise for 1 hour. Preheat oven to 175°C and bake for 20-25 minutes until browned and cooked through. Brush top with honey before serving.